Rakuten Securities Australia Pty Limited (ACN 153 803 804) is a wholly owned subsidiary of Rakuten Securities, Inc. Rakuten Securities, Inc. is one of the largest retail FX brokers in the world by volume and is a subsidiary of Rakuten Inc. (TOKYO: 4755). Rakuten Securities Australia Pty Ltd does not solicit business in Japan or the U.S. Rakuten Securities Australia does not accept applications from those residing in Japan or the U.S. Risk Warning: Rakuten Securities Australia Pty Limited (ACN 153 803 804) (Rakuten Securities Australia) is an authorised provider of over-the-counter derivatives such as margin foreign exchange contracts, contracts-for-difference (CFD). 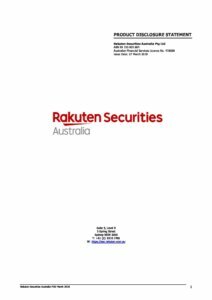 Rakuten Securities Australia holds AFSL number 418036. Investing in over-the-counter derivatives carries significant risks and is not suitable for all investors. You could lose substantially more than your initial investment. When acquiring our derivative products, you have no entitlement, right or obligation to the underlying financial asset. Rakuten Securities Australia is authorised to provide general advice only. Information provided is of a general nature only and does not consider your objectives, personal circumstances or needs. Rakuten Securities Australia recommends that you seek your own independent personal financial advice before you decide to invest in our products. A Product Disclosure Statement (PDS) for our financial products and our Financial Services Guide (FSG) are available on request and will be sent to all live account applicants. The PDS and FSG are important documents and should be reviewed prior to deciding whether to acquire, hold or dispose of Rakuten Securities’ financial products or services.